Being only about 37 nautical miles from Piraeus, the port that serves Athens, Hydra is a very convenient island for holidays. Despite its closeness to Athens, Hydra possesses all the charm and characteristics of a typical Greek island. Below, you can find all the Hydra ferry timetables, journey times as well as our best prices. Hellenic Seaways is one the largest and best known of the Greek ferry operators. In addition to conventional ferries, the company also runs catamaran type vessels and fast ferries which can sometimes be up to 50% faster than other companies with conventional ferries. This means that you can island-hop and have even more time to enjoy your destination. Their ferries are modern and provide a full range of facilities on board. 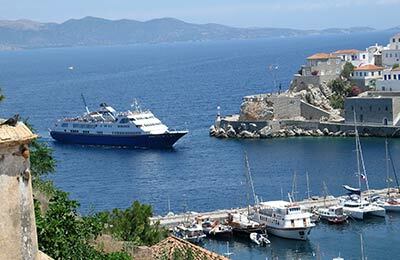 Whatever route you take to or from Hydra, you are certain to have a great trip with this famous Greek ferry company. The island of Hydra is located in the Aegean Sea between the Saronic Gulf and the Argolic Gulf and is separated from the Peloponnese by a narrow strip of water. In ancient times the island was known as Hydrea, meaning "water" in Greek, a reference to the islands natural springs. The main town called "Hydra port" has a crescent-shaped harbour with restaurants, shops, markets and galleries that cater to tourists and locals. 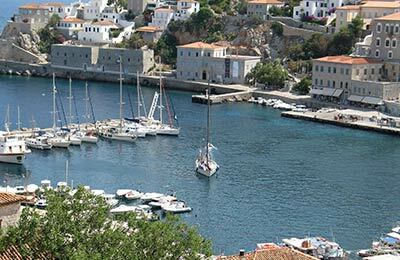 Hydra has good ferry links to Ermioni, Spetses, Piraeus, Poros and Porto Heli.